The Best Plan for Living Happily in Toronto’s Kensington Market is a poignant, metaphor-heavy story in which a young woman named Violet questions the meaning of life. This intense reflection is triggered by the upcoming wedding of her childhood friend. The journey of self-discovery leads Violet to a dark cave, where she can sort out her thoughts and feelings, free from technology and society. You can see it at Videofag. Violet (played by the writer Julia Lederer) is the uneasy, unenthusiastic bridesmaid, and Linda (Rebecca Applebaum) is the stressed-out future queen for the day. Even though Linda’s need to impress every single guest with perfect meals, stationery and seating arrangements contrasts with Violet’s navel-gazing internal debates about life, their best-friend chemistry was strong and touching, as my guest noted. I too felt they had a solid bond and interesting dynamic. Violet is very much affected by Plato’s Allegory of the Cave. It’s about people who are stuck in a cave facing one wall, and who grow up seeing only shadows. For them, these shadows form their reality, and anyone who says otherwise should be punished. The perception of reality is always being questioned by Violet. From calling websites “cloaks,” and recognizing that “you can be a great explorer without ever going outside” (because you go online instead) to not wanting her “face to be judged and swiped on Tinder,” Violet questions the artificial nature of the Internet. She gets us thinking about appearances, as Lederer likely sought to do. Violet is fortunate to have a caving mentor (Michael Eisner) who follows her into her cave. I don’t think we ever learn his name, which is fine. This character seems to exist in order to help Violet figure out her understanding of truth and relationships. He is like a handy voice in her head who can listen to her wedding speech and remind her that she’s hard to follow. I felt like I had descended along with her to her cave as well, thanks to the use of effective use of echoes, dripping sounds and shadows. Throughout the play, the shadows projected on the backdrop were curious and telling. I personally felt that these moving images were a highlight of the play. Thanks to projected visuals and big blocks, we travelled in places like Violet’s living room, her workplace, a pub, a museum, and then finally the all-important cave. Pretty good for a long and narrow room that fits only about 30 people! 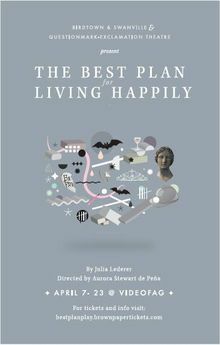 Take a poetic journey into your own deep dark cave by seeing The Best Plan for Living Happily. You’ll emerge refreshed and enlightened. Showtimes: April 7 to 23 at 8 p.m.